Home Recipes	Shrimp Scampi Recipe! TGIF, friends! Today I want to share with you a new recipe. I picked up the instruction card at Publix this past week and gave it a try. 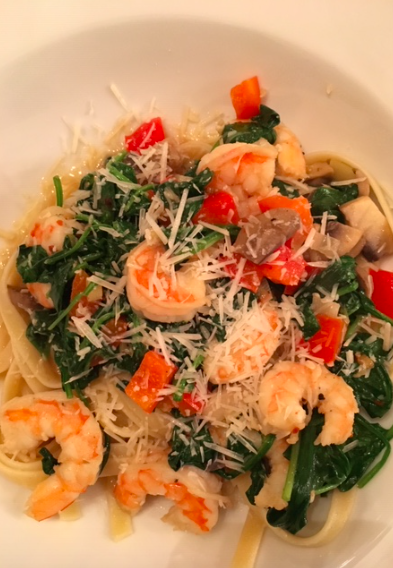 Come see how easy and delicious it is to make Shrimp Scampi! After the hustle and bustle of the holidays is over, I always find myself searching for new and simple recipes. When I was at the grocery store the other day, I stopped by a recipe carousel and found the recipe for Shrimp Scampi. Most of the ingredients are things I typically have on hand. Including frozen shrimp. I like to keep a bag of this frozen shrimp in my freezer for shrimp recipes or a quick snack. The shrimp are cooked, peeled and deveined but still have the tail. For a quick snack, I thaw a handful of shrimp and make a quick cocktail sauce using ketchup, horseradish and fresh lemon juice. Yummy! 1-Bring water to a boil for pasta and cook and drain according to directions. Set aside and keep warm. 2-Chop garlic and peppers. Preheat large saute pan on medium for 1-2 minutes. Place olive oil in pan and add garlic and cook for about 3 minutes until garlic edges begin to turn brown. Add peppers, shrimp, red pepper flakes, salt and pepper and cook and stir for about 1 minute. 3-Add broth, cook 2-3 minutes or until reduced by about ½ and shrimp are pink and warmed. Reduce heat to low and add butter and spinach. Toss until the butter melts and spinach wilts. NOTE: We also added ½ cup fresh mushrooms and scallions along with the garlic and peppers. My husband and I start nearly every recipe with olive oil, garlic and onions. Not only is this dish delicious, but pretty to boot! And it only takes about 20 minutes to make! The recipe card says this makes four servings at about 520 calories per serving. Want to impress your next dinner guests? Serve them Shrimp Scampi along with a fresh salad and crusty baguette!